NEW Elemis Advanced Skincare Nourishing Omega-Rich Cleansing Oil 195ml / 6.5 fl. NEW Elemis Body Soothing Quiet Mind Temple Balm 15ml / 0.5 fl.oz. To use: Massage onto the back of the neck, ear lobes and temples. NEW Elemis Advanced Skincare Sensitive Cleansing Wash 200ml / 6.7 fl.oz. To use: Apply mornings and/or evenings. Mix with warm water to create a lather and apply to the face and neck. NEW Elemis Advanced Skincare Hydra-Boost Serum 30ml / 1.0 fl.oz. Twist off the top and warm between the palms before applying to the face and neck. Green/Night: Moringa Pterygosperma Seed Oil, Tocopheryl Acetate (Vitamin E), Lavandula Hybrida (Lavandin) Oil, Fragrance (Parfum), Linalool, Limonene, Citrus Aurantium Bergamia (Bergamot) Fruit Oil, Geraniol. NEW Elemis Advanced Skincare Skin Buff 50ml / 1.6 fl.oz. The fine exfoliating granules wipe away dead skin cells, leaving the complexion brighter and better able to breathe. To use: Apply twice a week. Warm between the palms before massaging onto the skin with light, circular motions. Pro-Collagen Cleansing Balm (Salon Size) 240g. NEW Elemis Men S.O.S. Survival Cream 50ml / 1.6 fl.oz. To use: Warm between the palms and apply to cleansed face. NEW Elemis Advanced Skincare Pro-Radiance Illuminating Flash Balm 50ml / 1.6 fl. In addition, purple orchid, noni and acai help defend against the early signs of skin ageing. To use: Apply mornings and/or evenings to cleansed skin. New listingNEW Elemis Advanced Skincare Skin Buff 50ml / 1.6 fl.oz. To use: Close eyes and spray directly over the face. Pro-Collagen Marine Cream Ultra Rich (Salon Product) 50ml. Blended with Ginkgo Biloba to provide superior free-radical protection. A unique non-granular exfoliating cream. Perfect for sensitive or mature skin types. Date 2021 New Box. Muscle reviving body gel. For head and scalp tension, apply and massage onto the forehead and temples. Expiration Date 2021. Product Instant Refreshing Gel. Formulation Gel. Country/Region of Manufacture United Kingdom. Soothing Apricot Toner 200ml. Extracts of apricot soothes & harmonizes skin. Alcohol-free toner for clarifying complexion. Gives skin a fresh sensation & radiant appearance. Perfect for extra-sensitive delicate & hormonal skin. Pro-Collagen Quartz Lift Peel Off Mask (Salon Product) 10x15g. Formulated with Quartz Padina Pavonica & adaptogenic Noni. Deep Cleanse Facial Wash (Salon Size) 500ml. Contains spearmint peppermint & oak bark in a unique milk protein base. Features a fast-acting gel formulation. NEW Elemis Advanced Skincare Peptide4 Plumping Pillow Facial 50ml / 1.6 fl.oz. To use: Apply evenings to the cleansed face. NEW Elemis Advanced Skincare S.O.S. Emergency Cream 50ml / 1.6 fl.oz. To use: Apply mornings and/or evenings. Enriched with Barley Sseed extract Potassium PCA & Cupuacu butter. Energizing Skin Scrub (Salon Size) 250ml. Quickly resurfaces & polishes skin. Removes excess oil dirt & dead skin cells. Exfoliates, brightens, smoothes. Recharges and primes the skin for a clean, smooth shave. Resurfaces, polishes and brightens the skin, lifting the facial hair before shaving. Helps to prevent ingrowing hairs and blemishes. Skin is left feeling smooth, refined and deeply cleansed. ELEMIS DYNAMIC RESURFACING FACIAL PADS - 60 × 2.1 INCHES These dual-action resurfacing pads, powered by Elemis's patented Tri-Enzyme Technology, act as a very effective, yet gentle skin-perfecting exfoliator. An innovative and refining treatment that boosts radiance for a luminous complexion. Aching Muscle Super Soak 400ml. A soothing aid for athletes or rheumatic aches & pains. Pro-Collagen Marine Cream 30ml. Formulated with Marine extract Padina Pavonica. A groundbreaking anti-aging facial cream. Dynamic Resurfacing Serum 1 (Salon Product) 15ml. Harnesses the unique synergy of four flower AHAs to maximize the non-abrasive resurfacing action. A skin re-surfacing & smoothing facial serum. Dynamic Resurfacing Serum 2 - Salon Product 15ml. A clinically proven resurfacing facial serum. 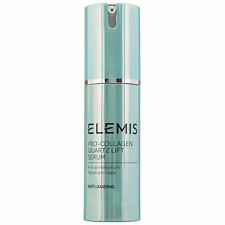 NEW Elemis Advanced Skincare Peptide4 Night Recovery Cream-Oil 30ml / 1.0 fl.oz. To use: Apply in the evening to cleansed skin and avoid the eye area. NEW Elemis Men Pro-Collagen Marine Cream 30ml / 1.0 fl.oz. Padina pavonica provides amazing anti-ageing benefits to help maintain your skin. To use: Apply daily, mornings and evenings. Warm between the palms before smoothing over the face and neck. Dynamic Resurfacing Serum 3 - Salon Product 15ml. A clinically proven resurfacing facial serum. Hydra-Active Soothing Gel Mask (Salon Product) 10pcs. Features a soothing formula that instantly calms & deeply hydrates skin. Leaves skin soft smooth & comfortable. Hydra-Active Soothing Gel Eye Mask (Salon Product) 10pcs. Features a skin-cocooning gel texture. Leaves the eye area dewy calm & vibrant looking. Formulated with orange flower & cornflower extracts to comfort & cool skin. Pro-Intense Lift Effect Jowl and Chin Mask (Salon Size) 10pcs. A revolutionary lifting mask for jowl & chin. Contains cutting-edge plant stem cells nutrient-rich lipids & super-lifting plant actives. NEW Elemis Advanced Skincare Gentle Foaming Facial Wash 150ml / 5.0 fl.oz. Skin is left feeling revitalised and complexion is balanced, comfortable and refreshed. Add warm water to create a luxurious, creamy lather, then rinse off. Here at Beauty4Myself we do not shout at the person who dropped the pallet of Chanel fragrance - we embrace it. just for you for your dressing table. We have all been in a sticky situation once in our life: we're only human!